One of the movies I’ve seen this summer was “X-Men: Days of Future Past” and it contained one of the funniest and well-choreographed set pieces I’ve ever seen in a superhero pic. In this scene, Quicksilver uses his super speed to help his fellow mutants escape security guards as they attempt to spring Magneto from a high-security prison. In the blink of an eye — but slowed down for us viewers — Quicksilver disarms the guards, samples some food and puts them into ridiculous poses, all with panache and wit. Hilarious and creative. 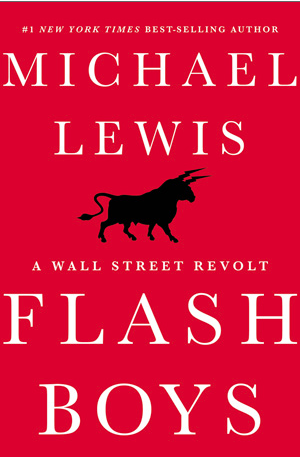 “Flash Boys” tells the back story of a relatively recent phenomenon known HFT or high-frequency trading, a tactic used by Wall Street traders in which people and institutional investors alike get fleeced because their high-speed data connections are slower, by milliseconds, than the traders’ connections, giving them time to “front run” the order and raise the price just enough to skim a few pennies off a trade. When those trades are multiplied over the course of a day, week, month or year, the pennies skimmed by those Quicksilver-like traders add up to multimillions of dollars. While it might sound like the cost of doing business to some, HFT is in reality a noxious practice that should be illegal but isn’t because the law was unable to keep up with the technology of high-speed fiber optic connections, computer software and algorithms that kept most humans, who might complain if they knew what was happening, completely in the dark. I’m reading Lewis’ book now, and it is truly fascinating, a heckuva work of investigative journalism. It’s a whodunit with colorful characters, good and bad, with an honest and righteous protagonist on quixotic journey through the concrete jungles and fiber-optic conduits of Wall Street. This man on a mission to clean up Wall Street is supported by allies whose sundry areas of expertise help him unravel the mystery of HFT and then attempt to replace it with something better, fairer and more just. Not only that, he has founded a new market, IEX, and its calling card is that it is a fair place where investors can go to trade stocks, without all the smoke and mirrors. Whether IEX succeeds long-term is a part of the “Flash Boys” story that is ongoing in real time. That honest man, incidentally, is a Canadian of Japanese ancestry named Brad Katsuyama. Interestingly enough, many of his allies (Rob Park, Bill Zhao, Allen Zhang, et al) also turn out to be of Asian ancestry; one of those key allies who is not Asian American is an Irish immigrant named Ronan Ryan. Meantime, most of the programmers who came up with the HFT computer programming are Russians. 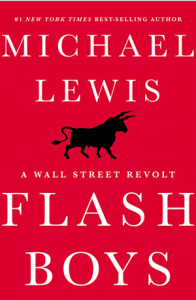 “Flash Boys,” like Lewis’ book “Moneyball,” screams to be adapted into a movie. It’s that compelling. If “The Social Network” — the dramatization of how the modern-day phenomenon called Facebook came to be — could become a critically acclaimed and financially successful movie, “Flash Boys” as an expose of Wall Street malfeasance certainly has the potential to do the same. According to Variety, Sony Pictures Entertainment was closest to optioning “Flash Boys,” to be produced by Scott Rudin and Eli Bush. That Sony looked like it was sewing up the rights was, to me, disappointing news. A better studio would have been Warner Bros. Pictures. With its chairman and CEO Kevin Tsujihara, it would no doubt have a better handle on how to portray a Japanese Canadian, who would definitely have more in common with a Japanese American than a Japanese national. From my perspective, Sony has for the last several years had a lousy record in adapting movies with any sort of Japanese connection, all the more disappointing since Sony is a Japanese company. “Green Hornet” (with sidekick Kato) was awful. “Godzilla” from 1998 also was awful. “Memoirs of a Geisha” was slack and forgettable. Hopefully producers Rudin and Bush will be able to overcome this curse. 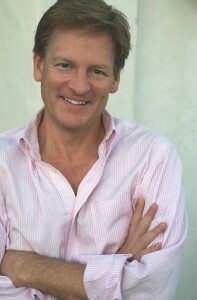 The real test will be the script and equally important, the casting. Hollywood overall has had shameful record, even in recent years, of whitewashing. That’s when, for the purposes of this column, an Asian or Asian American protagonist in a story based on a true event gets a race change in the script and becomes white. The thinking, which is an insult to anyone with a conscience or working gray matter, is that American audiences won’t see a movie starring an Asian lead. A couple of recent egregious examples are blackjack movie “21” and “Avatar: The Last Airbender.” Both had source material in which the main characters should have been played by people of Asian descent, but instead used white acting talent. One of the few exceptions was 1994’s “Dragon: The Bruce Lee Story,” but there was no choice in that situation since Bruce Lee was who he was — an American-born, Hong Kong-raised Chinese. I would imagine that Brad Katsuyama is now so associated with the story portrayed in “Flash Boys” that there would be no whitewashing possible. But with Hollyweird, one never knows for sure. So, who could play Brad Katsuyama? I’d not even hazard a guess; it’d be a fantastic if an actual Japanese American or Japanese Canadian could bet the part, but these days, it seems American actors of Korean and Chinese descent outnumber Japanese Americans. If that happened, that’d be perfectly fine by me. Regardless, this is one of the rare, great leading roles in which there would be no option to hire anyone other than an Asian American or Asian Canadian. Not an Asian from Asia, even from Japan. Brad Katsuyama has to be North American, born and bred, simple as that. And, whoever plays him, it will be that lucky actor’s role of a lifetime, what Sulu was to George Takei or Mr. Miyagi was to Pat Morita. George Toshio Johnston has written this column since 1992 and can be reached at [email protected] The opinions expressed in this column are solely those of the author and do not necessarily reflect policies of this newspaper or any organization or business. Copyright © 2014 by George T. Johnston. All rights reserved.